This paintable white skirting looks particalry modern due to its cubic design. The 100 mm moulding can easily fixed in place using glue, nails or screws while the 70/58 mm version can be attached with mounting parts. This classic profiled moulding is covered with a high-quality finish foil. The 100 mm moulding can easily fixed in place using glue, nails or screws while the 70/58 mm version can be attached with mounting parts. 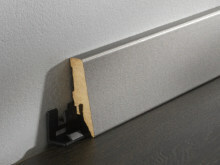 This modern-looking skirting is also covered in base foil, but comes with a rounded top edge. 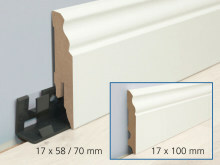 The mouldings can be easily fixed in place using glue, nails or screws. 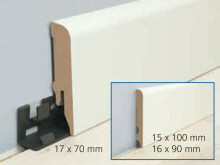 The 70 mm-high skirting can be fixed in place with mounting parts. 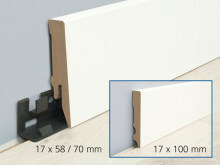 This modern straight MDF skirting is covered with genuine aluminium foil and comes in five different metal-effects. It can be affixed with mounting parts and also allows the concealed routing of cables.